Helps combat hereditary hair loss and hair thinning. Proven to promote hair thickness and regrowth. Is Regaine for Women Regular Strength suitable for your type of hair loss? 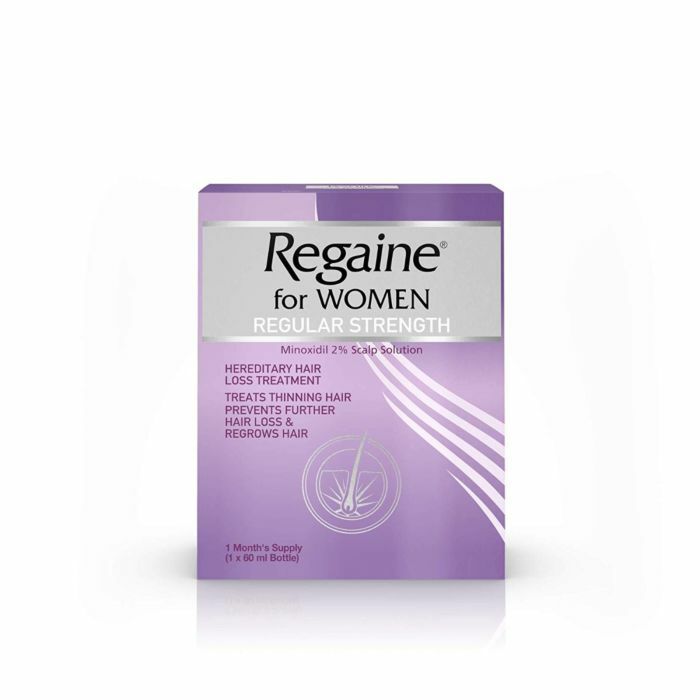 Regaine for women regular strength is for women with a family history of hair loss who have a general thinning of hair at the top of the scalp (vertex). What makes it such a success is its active ingredient, minoxidil, which works effectively to stop hair from thinning and can regrow thicker and fuller hair. Minoxidil is a drug which has been extensively researched and tested for its safety and effectiveness in treating thinning hair. Scientists believe it works by helping the blood flow to the hair follicle, stimulating and prolonging growth for a genuinely thicker, fuller head of hair. This pack contains one 60 ml bottle of Regaine for Women Regular Strength. One pump spray applicator. One extended spray-tip applicator. One rub-on applicator. Please read all pack information, including the leaflet inside, before using Regaine for Women Regular Strength: It takes time to regrow hair. In trials 3 out of 5 women reported hair re-growth after 32 weeks, Hair re-growth may become noticeable after 4 months. Regaine for women regular strength will not work for everyone. See pictures on the side panel to decide if this product is suitable for your type of loss continuous use is necessary to improve and maintaining your hair regrowth.